From natural ombré and subtle sombré, to vivid dip-dyes and popping rainbow locks - the two tone look has established itself a firm style favourite. It’s not hard to see why - with celebs, Instagrammers and Pinterest boards alike constantly showcasing two tone hair colour, this is the look that can be mixed and matched to suit just about every style and length going. No matter skin tone, eye shade or your base shade, there’s always a way to work the two tone look. So, whether you’re after a sun-kissed ombré or pastel dip-dye, discover our favourite looks and check out our two tone hair colour ideas below! Perfect that pastel look with our washout LIVE Icy Blue Pastel Spray, for when you want colour without the commitment. If you haven’t got light blonde hair, you will need to pre-lighten with one of our LIVE Lighteners before colouring. Take your ombré to new heights by mixing and matching bold hues. 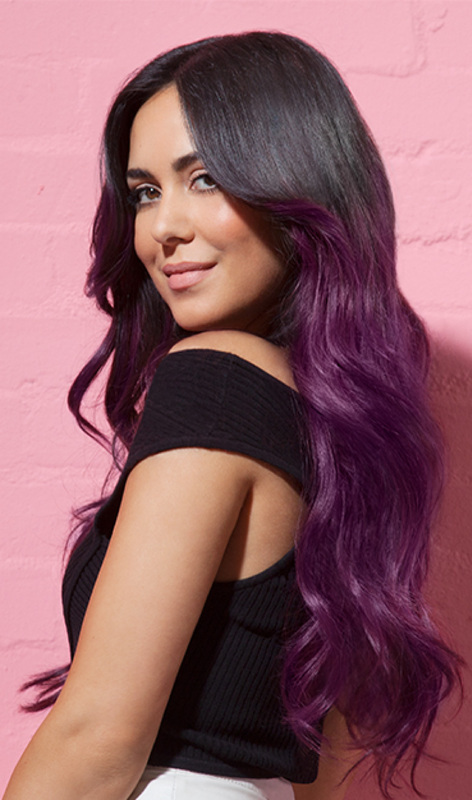 Recreate this look using our LIVE Purple Punk at the roots and our LIVE Shocking Pink in the mid-lengths and ends - don’t forget to blend the two shades for a dreamy ombré! Embrace a two tone aqua vibe using our LIVE Electric Blue through your locks, finishing the tips with our LIVE Purple Punk shade. And don’t forget to swoosh! Because, what’s better than two-tone pink? Use our LIVE Shocking Pink through the back of your hair, then mix the colour cream with the in-pack conditioner to create a pastel pink look and apply to the front sections of your hair. Love! Two-tone, three-tone or ten-tone! Why stick to two shades when you can embrace every colour of the rainbow?! Use our LIVE Aqua Collection to create a multi-toned look, applying just to the underneath section of your hair for a hidden ‘do. Blunt bobs are just everywhere right now. To add a bit of extra drama to the look, paint our LIVE Turquoise Temptation through the tips to make one major statement! Soft pastel hues create a beautifully subtle ombré look. You can easily create two tone hair colours using our LIVE Ultra brights or Pastel range - mix them with the in-pack conditioner or LIVE Pastel It! to achieve gorgeous custom shades. Dramatic roots are so in right now. When applying colour, leave the top inch of your roots without colour for an immediate ‘I woke up like this’ look. Or just don’t touch up the roots for a while and you’ll be rocking the pastel-grunge look in no time! Craving an ombré that packs a punch? Opt for our LIVE Max Blonde shade and brush through the last third of your hair, finishing in loose curls for a tousled two tone look. Ombré needn’t be confined to blonde locks. Darker tresses can be transformed using our LIVE Intense Lighteners - using the jawline as the point for the colour transitioning to begin, you can use a new toothbrush to blend a natural looking sweep of colour. Don’t forget to finish with a toner like LIVE Colour Refresher for Cool Blondes to help knock out residual brassy tones. Perfectly suited to Autumnal months, this combo of our LIVE Cherry Mahogany through the top with our LIVE Absolute Platinum through the mid-lengths will look fabulous on frostier days. We hope you’re now well and truly inspired with our two tone hair colour ideas, and before you rush out to the shops, you can check our colour stockists here.